Update: My comments about the P3 color gamut in this article also apply to the 2016 MacBook Pro, which introduced the P3 gamut display to Apple laptops. Wait…what is the P3 color gamut? A lot of people have heard of the sRGB color gamut that most computer displays and mobile device displays are based on, and many photographers and designers know that the Adobe RGB gamut covers a significantly larger range of colors. But this P3 color gamut is less well known; what is it and where did it come from? P3 is based on the color gamut produced by the xenon bulb used in digital cinema projectors. Hollywood uses P3 for mastering because it’s the final output space of motion pictures delivered to digitally equipped movie theaters. P3 is larger than sRGB by a big enough amount that a display that can cover P3 colors is considered a wide gamut display. Many wide gamut displays today are based on Adobe RGB, which I’ll also talk about in this article. 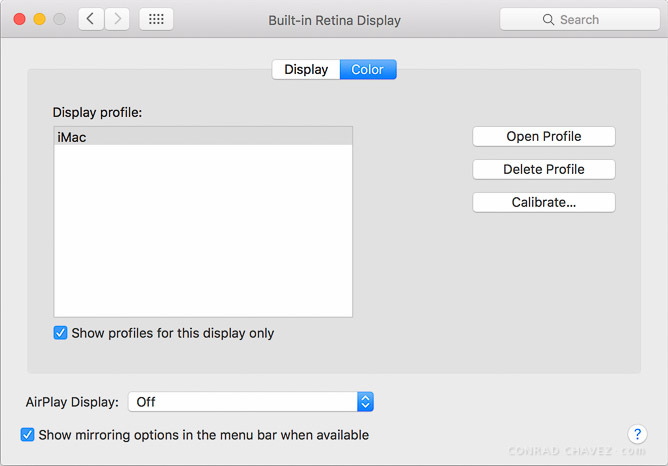 What’s the default display profile of the Retina iMac ? At the Apple Store I went straight to the first 27″ Retina iMac I saw. The first thing I did was open the Displays panel in System Preferences to check out the list of display color profiles. On many Macs the default display profile is Color LCD. On the iMac I tried, the selected profile was named iMac. Was the iMac profile the correct profile? I selected “Show profiles for this display only” and the only profile left was iMac. As far as the Mac system is concerned, the iMac profile is the only one that matches up with the display hardware. What’s the gamut of the iMac display profile? So the default iMac display profile does seem to be P3 gamut, or at least P3 is the target gamut. The difference between the Display P3 and iMac profiles is probably that the iMac profile represents the color gamut that the display panel is actually capable of reproducing. However, neither the iMac display profile nor Display P3 is exactly the same as the DCI-P3 digital cinema standard. A backlit device display reproduces images differently than a cinema projector in a dark theater, so when Apple adapted DCI-P3 into their own profile that they call Display P3, Apple adjusted their version to be more consistent with typical computer displays. 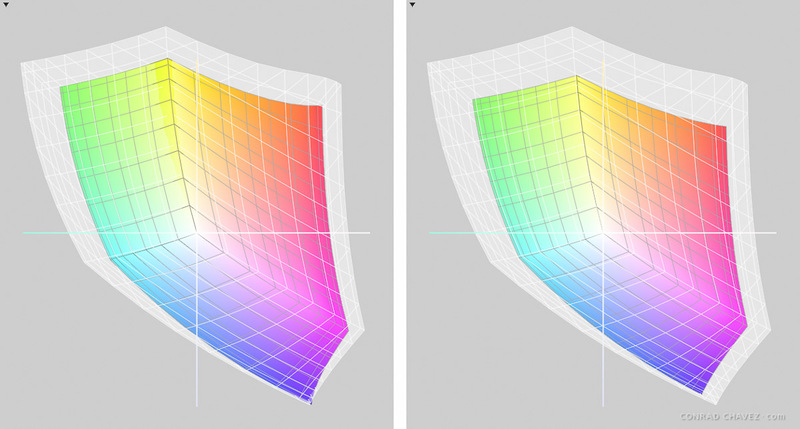 According to the Apple Developer API Reference, Display P3 “uses the DCI P3 primaries, a D65 white point, and the same gamma curve as the sRGB color space.” It looks like Apple wanted to keep as many sRGB characteristics as possible as they expanded the color range to the P3 color gamut. What if we compare the iMac profile to the Color LCD profile that is also found in the list of display profiles on this iMac? The Color LCD profile gamut is much smaller than the iMac and P3 profiles. However, the Color LCD profile is close to the sRGB profile, so I’m not sure why the Color LCD profile is even included with the iMac because its gamut is too small to describe the iMac display. At the Apple Store I didn’t have time to do much testing with real images, but an excellent article at astramael.com (The Wide Gamut World of Color — iMac Edition) does use sample photos to show the tradeoffs between the Adobe RGB, P3, and sRGB color gamuts. That author also tried something that I didn’t: They brought a colorimeter to the Apple Store, hoping to make their own profile and gamut plot of the P3 display. They report that the Apple Store staff did not allow them to connect and run the colorimeter. For that reason, both that author and I are comparing the Apple-supplied profiles that we found on the iMacs themselves. The Apple Store I went to had no problem with me copying screen shots and profiles to my USB flash drive. Note that for true digital cinema work, just having a P3 color space isn’t enough. The Digital Cinema Initiative (DCI) standard also specifies a gamma of 2.6 and a luminance of 48 cd/m2 or 100 cd/m2 depending on whether you’re targeting movie theaters or television, and there are also various white point standards. The iMac at the Apple Store was set to maximum brightness which is way too bright for digital cinema or print work, so you’ll need to crank down the brightness of the iMac display and probably still have to use a display profiling device to make sure the display is hitting the correct gamma, luminance, and white point numbers for the specific standard you’re targeting. How does the iMac P3 display handle untagged objects? One of the challenges of wide gamut displays is that the colors in untagged objects (objects without a color profile) can appear oversaturated. This can happen when the color values of untagged objects are defined in a smaller color space such as sRGB, which is usually the case. When those untagged color values are displayed on a larger gamut display, if their gamut is simply scaled up to match the larger gamut the color values can end up further out than they should be in the larger color space, appearing oversaturated. I believe I saw evidence of this when looking at the Late 2015 Retina iMac. I looked at things like the colorful icons in the Applications folder and the graphics in the Maps application. I opened the same windows on the iMac and on a 15” 2015 Retina MacBook Pro near it. Even when I turned up the brightness of the MacBook Pro all the way, the colors in the iMac screen were much more vivid. Not just “this display shows more colors” saturated, but some colors seemed to have that unnatural “radioactive” glow that’s associated with untagged objects on wide gamut displays. To me this indicates that Apple may not have completely color-managed Mac system elements for wide gamut displays. I see the same effect on untagged objects when my NEC PA272w display is in wide gamut mode. I hope to hear more about general untagged color handling on this display from anyone who knows more or is able to test it more thoroughly. As for the Web, it looks to me like untagged image and CSS colors are rendered correctly in the Safari web browser, but not necessarily outside Safari, such as in the Finder. The tweets below explain why untagged colors in Safari are no longer as screwed up as they used to be on a wide gamut monitor: Safari now does the right thing, in that when Safari 9 sees colors without a profile (untagged) it will assume the colors are in the sRGB color space and convert to wide gamut from there. When Safari sees an image that is tagged with a color profile it will continue to do what it correctly did before: use the image’s profile to convert its colors to the wide gamut display profile, in this case iMac P3. New iMacs have wide-gamut displays. Safari will correctly treat CSS colors as sRGB, and render wide-gamut images. Does the iMac P3 display have an sRGB mode? Wide gamut displays can be a challenge for developers of games, mobile apps, web sites, and other content targeted for average consumer displays, because of the oversaturation of untagged content that I just described. Colors can appear unnaturally intense if they’re not mapped properly to a wide gamut display. Professional wide gamut monitors work around the oversaturation problem by providing an option that restricts their gamut to sRGB. Some let you switch to an sRGB emulation mode through a control on the front panel of the display; with others you switch modes using utility software. The Retina iMac doesn’t do it either way, or at least not in any way that I was able to find. When I searched the system help files of the iMac for “P3” or “sRGB” nothing came up. In general, the Mac help files for color management are pretty thin. If the iMac P3 display doesn’t have a way to emulate an sRGB display, buyers of the Retina iMac should be aware that colors might not display as expected in untagged objects or in applications that are not color managed. I’m not 100% sure that there is no sRGB emulation mode on this display, but that’s how it’s looking. If you have more information on this, please post in the comments. You may sometimes see a suggestion to open the Displays system preference and select the sRGB profile. That is not going to help, because that’s not how display profiles work. A display profile describes the color behavior of the display, but it can’t change that behavior. So choosing the sRGB profile can’t and won’t make the monitor display the sRGB gamut. What choosing an sRGB profile will do is lie to the OS about the color gamut of the monitor, saying that the display is sRGB when it isn’t. That lie will cause colors to display incorrectly. But it isn’t Adobe RGB! Or does that matter? Some creative professionals who don’t work in video may be concerned that Apple has gone with a P3 panel instead of an Adobe RGB (1998) panel. After all, Adobe RGB has been the de facto standard for a wide gamut color space. 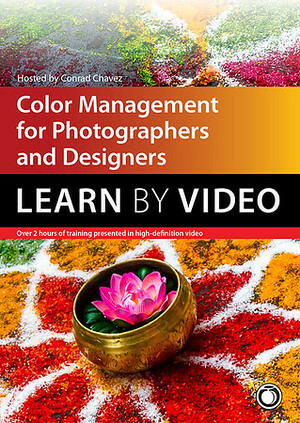 When there’s a color space option other than sRGB in a photography or graphic design application or on a digital still camera, Adobe RGB is usually the alternative you get. For that reason, Adobe RGB is the gamut around which most wide gamut displays are built, such as those made by Eizo, NEC, and Dell. By specifying a P3 gamut panel for the Retina iMac, Apple has consciously gone in a different direction. But you shouldn’t automatically conclude that P3 is going to ruin Adobe RGB workflows, because P3 and Adobe RGB are mostly the same size and shape. With P3 you do lose a few blues and greens, but you gain some yellows and reds. If color management is set up properly on your system, it will compensate for whatever color space your display uses and you should see consistent color. The only way P3 might be harder to use compared to Adobe RGB is if your work often involves the relatively few colors within Adobe RGB that are not within P3. I did see one possible area of concern when comparing some CMYK/print color gamuts against Adobe RGB and P3. Some of the print blues and greens that Adobe RGB can cover look like they aren’t covered by P3. If print is an important output for you, you might want to compare the gamut of your typical printing conditions against P3 to find out if you would rather have an Adobe RGB display. But you’ll still see more CMYK colors with a P3 display than you would have with an sRGB display. Adobe RGB, iMac P3, sRGB and SWOP CMYK color gamut comparison, based on plots by Color Sync Utility. Note that the gamut plots I’ve shown are generalizations. For one thing, the size and shape of each gamut varies with luminance, so for example the P3 gamut is going to look a lot different when you dim it down to the DCI luminance spec for a digital projector. 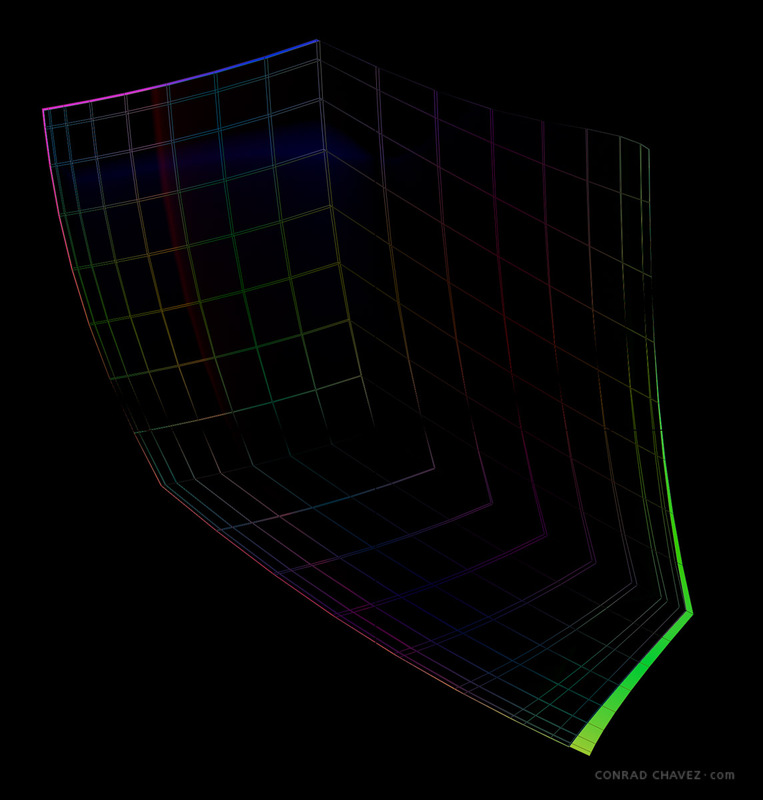 If you’re after the best possible visualization of gamuts, rotate them in 3D to see how they behave from light to dark. ColorSync Utility can rotate its 3D gamut plots, or you can use a more advanced gamut analysis tool such as Chromix ColorThink Pro which can also include sample images as part of the analysis. I welcome any corrections to this article from color professionals who may have more hard data about how the P3 display works on the Late 2015 Retina iMac, and whether the Mac system was adjusted in any way to better handle wide gamut displays. Especially because my time with the new iMac was limited. But until I hear otherwise, here’s my take on it. 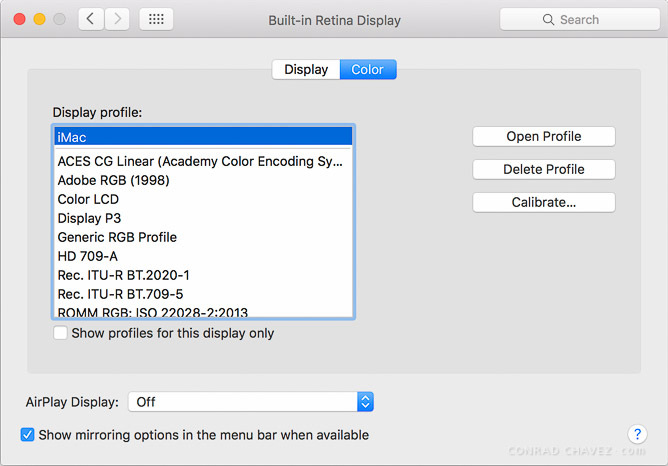 The wide gamut display of the Late 2015 Retina iMac should give you the best color you’ve seen on an Apple display, as long as you work in color-managed applications with content tagged with embedded color profiles. 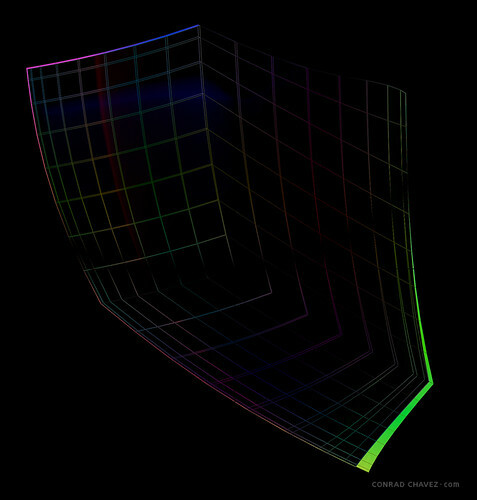 But untagged objects and colors in non-color-managed applications may display with distorted colors when rendered on a wide gamut display like this one. 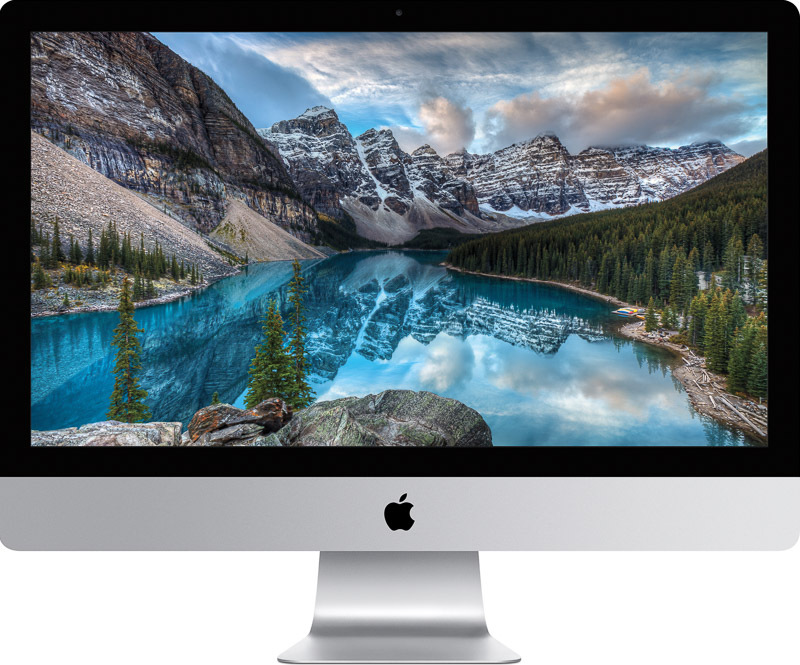 Because the Late 2015 Retina iMac display doesn’t seem to have an sRGB mode, if you need to proof colors for sRGB output, such as graphics in a game or app, or on a web page in a browser other than Safari, you may want to connect an inexpensive sRGB-calibrated display to the iMac. If you’re creating work that targets larger color gamuts than sRGB, such as fine art printing or digital cinema mastering, the wide gamut P3 display of the Late 2015 Retina iMac looks like a real improvement over previous iMacs, especially if you’re working in a color-managed environment. If you’re currently using a conventional sRGB-based display, the important difference is that P3 is still a big step up from sRGB, about the same as going from sRGB to Adobe RGB. You win about as much as you would have if the iMac had an Adobe RGB panel. I’ve read about photographers who bought a wide gamut display and plugged it into the iMac because the built-in displays on the older iMacs didn’t completely meet their needs. Now that the current Retina iMac includes a wide gamut display, most iMac-using photographers no longer need to buy and plug in a separate wide gamut monitor and give up the desk space for it. For those photographers, the new P3 display of the Late 2015 Retina iMac should save them several hundred dollars and free up a few square feet of desk space. ← OS X 10.11 El Capitan: Will Adobe software work? Great article ! Finally i found someone who had the same questions as i did, and answered most of them as well. I think I am returning mine. Way too contrasty and oversaturated. Eye strain inducing. Great, thorough explanation, but is there a bandaid solution at least so color looks like Safari? Firefox and Chrome are both oversaturated – it’s like looking at CMYK on an sRGB monitor. From what I’ve read, Chrome hasn’t addressed this wide gamut bug for 5+ years. Just awful. I don’t know of a way to solve this. A common workaround is to address it at the hardware level by putting the monitor into a mode that limits its gamut to sRGB. An sRGB emulation mode is a feature of several other wide gamut displays that have been out for years. But I haven’t found a way to do this with the iMac P3 display. As far as I know, the iMac P3 display is always in wide gamut mode and doesn’t have an sRGB emulation mode, which means color consistency depends on how well applications support color management. Which leads us right back to the problem with Chrome, which doesn’t properly support wide gamut displays yet. Bless you. I was fretting because I felt that I had jumped from my 2007 iMac running Snow Leopard into the cheaper mid-2015 27-inch retina iMac too soon – July, 2015, and missed out on the color gamut expansion in the newer machines by a whisker of a few months. Woe was me. But now I feel better ( sour grapes logic in a positive way ). My primary concern in any case is always fidelity in carrying the image I edit on screen to the paper. I have good success with my calibrated iMac, good profiles and good paper, so I can go back to being happy with the new machine, and can wait for Apple to improve the functioning of a larger color gamut and also get some shake-down cruises of Sierra out of the way. Speaking of over-saturation, which also affects perception of clarity and sharpness, Fox’s broadcast of the US Open Golf tournament this week commits that sin. The cartoon colors look unnatural and hurt the eyes and the contrast seems also screwed up so that shadows obscure the golfer’s faces in close-up. I’m not enjoying watching on Fox nearly as much as would be the case with broadcasts of the tournament on NBC or CBS. Also, their lead golf anchor is too loud. I’m a bit of a novice but after reading your comment regarding a calibrated imac I need to know how to do that. I recently purchased a Epson Sure Color SP400 printer and since have not been able to figure out how to get what was on my screen to come out the same on paper. Then my 2006 imac desktop screen died. I’m working with a small old macbook pro and this screen is totally different but am considering a 2013 or late 2015 imac from B&H. My primary concern is as you say gettig what is on the screen onto the paper. You say “your calibrated imac”. How did you calibrate your imac and what kind of printer are you using? I’m so glad that i have found this article because I’ve been looking for an answer for a week. The problem is that the colour of iMac late 2015 27″ 5K is too saturated to display untagged objects. I am a web designer and I’d like to use Sketch app to design UI and website. Unfortunately, Sketch app can only access the sRGB profile and the colour is total off, very bright and saturated; same as all other browsers (Firefox, Chrome and Opera), After Effect and Adobe Experience Design. I am so frustrated right now. If you somehow can find a workaround about this colour saturation issue, may you please post a solution here. This is much more appreciated. Thanks so much. Hi. I have a new MacBook Pro 2016 AND a ultrafine 4k monitor, both wide gamut. I came across this article because I’ve noticed that when doing video editing in adobe premiere and watching it in VLC the colours seem so much more saturated than they did on my old MacBook. But when viewing through QuickTime, safari, iPhone, etc the colours seem much more desaturated. It’s created a problem because I edit in premiere to something I think looks good and then it creates videos that look ok in VLC player but then washed out in QuickTime etc. So I have to OVERsaturate in premiere for it to look ok. I’m having a nightmare 😦 I don’t know what is going on, but it seems like you have an idea?!? For what it’s worth, when I attempt to change display profile, vlc and premiere dont change at all, but the other players do (watching the same video). Has this got something to do with colour management? Unfortunately this reply is long, because the issues are complicated. I looked at some videos on my display while switching it between sRGB and wide gamut modes, and I can see the same problem you do when it’s in wide gamut mode. However, there may be more than one issue going on here. The second, separate problem probably does have to do with wide-gamut displays like your P3 gamut LG Ultrafine, and is probably very similar to the problem the article describes with web content on the P3 iMac display. You talked about changing the display profile, but that probably won’t help. As I wrote in the last paragraph of the section “Does the iMac P3 display have an sRGB mode?” in the article, the only correct profile to use for a display is the profile that most accurately describes the actual behavior of the display. In your case, that would either be an LG Ultrafine 4K profile that got installed with the display, or a profile that you generated for it using a display profiling device. If you apply any other profile, such as an sRGB profile, that will only tell the system that the display is sRGB, which is not true, so it won’t show the right colors. If the correct display profile is applied, that should solve the problem for all color-managed applications. But it probably won’t solve the differences you’re seeing between players and Premiere Pro, because they have varying support for color management and make different assumptions about how to interpret video colors. The reason it’s not a problem with my wide gamut display is that it lets you switch between gamuts — not just changing the profile, which I’ve said above is not enough, but changing the actual range of colors the display is showing. I always switch my display to sRGB mode while editing in Premiere Pro, so colors are reproduced as consistently as they can be (although the first problem above still exists). Can you do this too? Well, I don’t know if the LG Ultrafine displays can be switched to sRGB. I went to the LG website and downloaded the manual for the 4K Ultrafine, but the word “gamut” isn’t even in the manual. Since that display is entirely software-driven, you should open the LG Screen Manager software (if you installed it) and see if there is an option for switching the display between wide gamut and sRGB. If there is, you should switch the display to sRGB while editing in Premiere Pro and when previewing exported video. It is funny. I actually posted the question in Creative Cow in the comment above. I mainly work on web content videos. And recently I just jumped ship to PC, I set my NEC PA241W monitor to sRGB and my MSI laptop as a second monitor. The monitor is a bit old and is geared toward graphic designer purpose. And now, everything just match from chrome, VLC, Explorer, Vimeo, Youtube, and WMP. Quicktime still gives headache but I honestly don’t care about quicktime anymore. I can duplicate the result when switch my monitor mode to adobe RGB as well. I don’t know why, this seems so difficult with Mac system. But anyways, since I work mainly in video now. So I figure I should be OK as long as I set my monitor to sRGB. I do more detailed color in davinci and faster turn around with premiere pro. Everything seems working well. I color graded a few videos on a iMac 5k. I feel P3 is actually pretty good for web content color work. Since so many of use are using mac products and I assume mac will be standardize their future products with P3. It seems its a secure path for video work no? Maybe the next right move is to purchase a monitor (Like Benq PV270) that is able to do sRGB and P3 as P3 is probably making to main stream? I have viewed one 5 times in the last 3 weeks at a local Apple store..
according to mac rumours could be released in March or April. the P3 is geared more towards video. professional photographers use sRGB or Adobe RGB. which is not fantastic when compared to many other monitors. I will be very much interested in any views about P3 colour space. For photo editing what colour space is best advised for the Retina model. 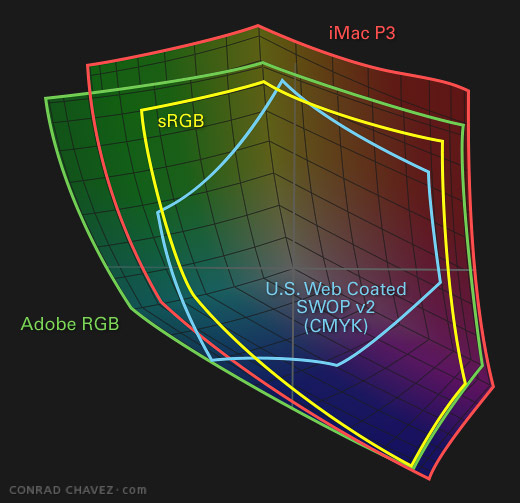 Regarding why Apple chose P3, after looking over some comparisons between P3, Adobe RGB, and sRGB, I think Apple wanted a color space that had an overall shape more consistent with sRGB. Adobe RGB looks more “off center” when compared to sRGB. Also, because Apple developers need to create application assets that work on both types of displays, Apple has done a few things at the developer level that try to make it easy to make a single set of object color values work in both sRGB and P3 (look up “Extended sRGB”). That would not work as well with Adobe RGB. Adobe RGB (1998) is a major standard, but if it was invented today, it might be done differently. Adobe RGB was invented to include as many CMYK colors as possible in an RGB color space that wasn’t too big to edit at 8 bits per channel. Those requirements are very appropriate for 1998, but not for 2017. CMYK output is not as dominant as it was when Adobe RGB was invented, and 16-bits-per-channel editing is much more common. Now the priority is less about print, and more about making sure colors are more consistent across devices. It doesn’t mean much to say P3 “only covers 80%” of Adobe RGB, when Adobe RGB doesn’t cover all of P3 either. They simply emphasize different colors, with neither being clearly superior (as seen in the examples at the astramael.com link in the article). 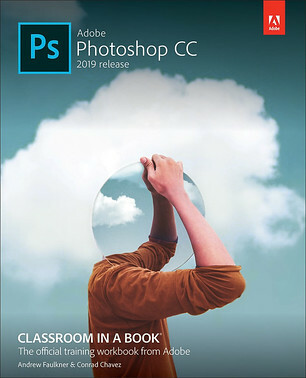 The important thing is that both cover much more than sRGB, and even more important is which one covers more of the colors that you need to preview for your final output. There are many cases where Adobe RGB doesn’t include some of the colors of final printed output. The fact that Adobe RGB is a standard doesn’t mean it’s also ideal. It isn’t. It’s just a popular alternative. 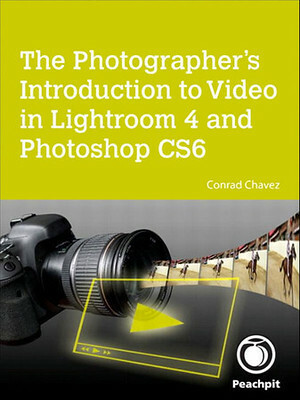 As for your question on which color space is best for the Retina model for photo editing, the specific display in use doesn’t determine that answer, so the answer has not changed: Edit in the color space that’s the most appropriate for your workflow and your most important final output, as you probably did with an sRGB-based display. 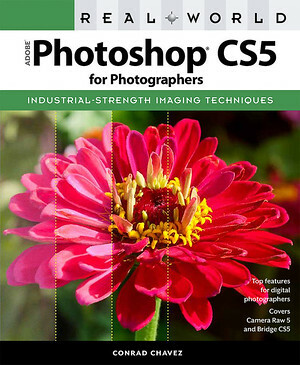 A fine art photographer can continue editing in ProPhoto RGB at 16 bits per channel. A prepress editor can continue editing in sRGB or Adobe RGB. A P3 display will be able to show more ProPhoto RGB or Adobe RGB colors than an sRGB display.